So it looks like our friend, Tiger Woods, is running into some money trouble these days. Money problems so bad that it appears he has been forced to star in a commercial for a heat rub product called Vantelin Kowa. With many of his old sponsors missing, it looks like he'll do anything to start making some more money...though I can't imagine he is doing THAT bad in the money department. 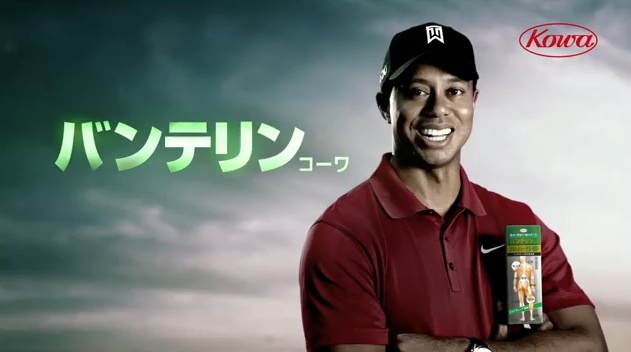 With the "Tiger" brand suffering in the U.S. it looks like his new strategy might involve the far east as a potential new market. Only time will tell if this tactic proves successful, but here in the U.S. he will have to do a little more than star in a commercial to sharpen up his image. I think most famous people do commercials in the East, doubt it has anything to do with money issues. Thanks for the comment! I suppose. I feel like it might have more to do with the fact that many companies in the U.S. don't think it's time to associate themselves with Tiger Woods just yet.